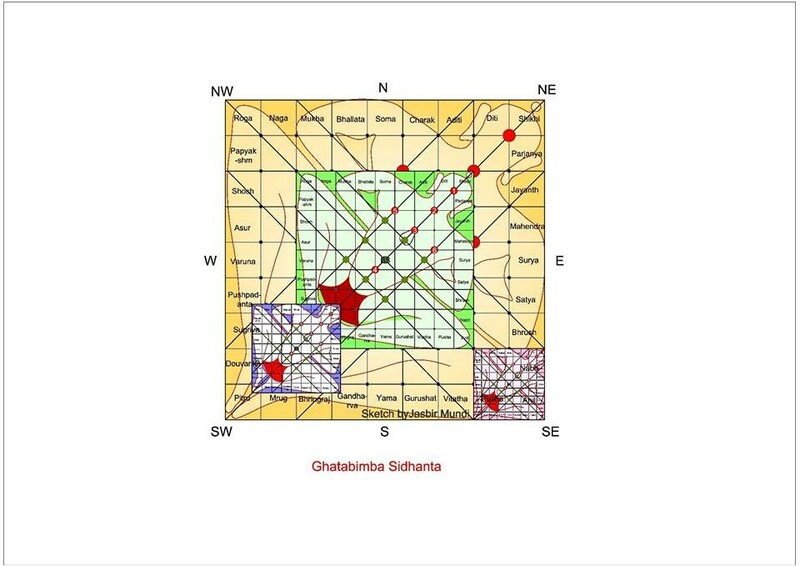 The theory of Ghatabimba Drushtanta is very important and it gives us missing links of vastu design. Parabramha first created the whole shrishti, but his creation would have been baseless. To give base to this, he created eight directions and to support these eight directions he created planets .To preserve these eight directions, he assigned eight parents as a defender called Astapala. Even though the gradient like colour, heat etc may vary but the whole world and parts of world, directions and planets guards in uniformity. Hence even in the smallest place the astapala of eight directions and planets never change. For example due to magnetic character, the infra-red rays is reflected more from the South hence Southern side of building is heated more as a natural phenomenon of absorption and reflection of heat And is reflected in Ghata-bimba. In other words the reflection of the moon that appears in a lake can also be seen in small pot (Ghat). The concept of Vastushastra should also be thought of on the same line. The size of vastupurusha should be proportionate to the size of vastu. E. g. The size of vastupurusha for town is of town size. For village it should be of village size and for residence, residence size.This is called Ghatabimba Drushanta.